The Fairy Tale Detectives is the first book in Michael Buckley's "The Sister's Grimm" series. I've been meaning to read it for quite some time because I knew the thought of a mystery featuring girl sleuths and fairy tale characters would be appealing, but I only recently stumbled across it at the library. Sabrina and Daphne Grimm's parents have been missing for a over a year, and they've been shuffled from foster home to foster home. When a mysterious and kind of kooky old lady claims to be their grandmother, their social worker is eager to send them to her. Of course, the eldest sister is filled with suspicion since her parents have always claimed that her grandmother was dead, and it takes a while to warm up to Granny Relda. When they arrive at Granny Relda's mysterious house, they soon learn that they are part of the Grimm family...yes, descendants of the Brothers Grimm. The most surprising part is that those "stories" the Grimm brothers wrote were real, and fairy tale characters are living incognito in the small town where the girls have moved. When a giant threatens the safety of the town and Granny Relda herself, it's up to the Sisters Grimm to save the day. Sometimes when I'm reading and evaluating books for this blog, I tend to get caught up in flaws and forget that I'm supposed to be evaluating it for the audience in which the books were intended. For me, I would have liked more character development, and the writing wasn't perfect. I was a bit annoyed when the author had Puck explain who he was. After all, who HASN'T read A Midsummer Night's Dream? I then had to remind myself that most middle graders probably haven't. Yeah, us English majors can get a bit uppity sometimes. HOWEVER, I do think that this book and the entire series will appeal to many many kids if they haven't discovered it already. I think girls especially will like the young sleuths, and if kids are familiar with fairy tales, they'll be delighted at all of the fairy tale references and Michael Buckley's interesting and unexpected depictions of them. It's fast-paced and humorous, and the end leaves a bit of suspense that begs you to read the next book. Give this to kids who love to read about mystery and magic. Happy Saturday everyone! Please enjoy the August Carnival of Children's Literature hosted at In Need of Chocolate. Sarah brings us a back-to-school theme, and you can find reviews of children's books that would work well in Social Studies, Language Arts, Physical Education, and other class subjects. You can also find read-alouds, middle-grade and YA books, and more. There are links to tons of great posts, so please check it out! Wow...it's hard to believe the summer is almost over. Our reading routine has definitely been inconsistent throughout the summer because we've spent a lot of time playing outside in the evenings, but as the days get shorter, I think we'll fall back into our regular reading routine. Over the past week, we've managed to read at least a little bit every day, and my daughter particularly enjoyed these books. My daughter absolutely loves this board book. The more Grover begs her not to turn the page because there's a monster at the end of the book, the more she wants to turn it. Lovable Grover's voice is captured perfectly, and my little one has fits of giggles on each page. I remember loving this book when I was a little girl, and seeing my little girl enjoy the same book is a wonderful experience. Yes, Mo Willems continues to be a well-loved author in our home. In this book, Wilbur, a naked mole rat dares to be a bit different and wears clothes to the other naked mole rats' horror. When members of the naked mole rat colony consult Grand-pah, the wisest naked mole rat of all, they all learn a little lesson about acceptance and daring to be different. A funny book with equally funny illustrations...highly recommended. What are YOUR kids reading this week? Leave your comments and links in the comments section below! Taking care of the Earth, reusing, and recycling is very important to me, and today you see a lot of books, cartoons, commercials, and toys that aim to teach kids how to do this. However, there are few products that actually seem as if they'd be interesting to kids. 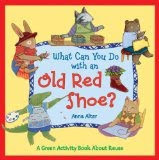 Anna Alter's What Can You Do with an Old Red Shoe? : A Green Activity Book About Reuse is an exception. Each spread begins with a little poem about how an object is no longer fit for its original purpose, and then different animal characters show kids, step-by-step, how they can reuse the old object instead of throwing it in the garbage. For example, with an old flip-flop, you can make a stamp. You can turn an old shoe into a planter, or use odds and ends like buttons, bottle caps, and coins to make magnets and jewelry. The step-by-step directions are easy to follow. Some are more complicated than others and may involve help from an adult, but the book is great at letting kids know what an adult should help with and how to safely execute each activity. Not only is this a good book that offers fun crafts and activities for families to do together, but it shows children how to help keep "junk" out of the landfill and how to turn old objects into useful items. 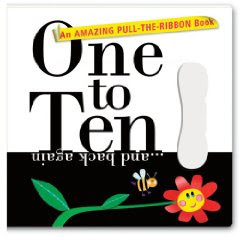 This interactive "pull-the-ribbon" book has been one of my daughter's favorite books since I bought it for her over a year ago. Now that she's learning to count and can recognize all of the insects and animals in the book, she wants to "read" it all of the time. 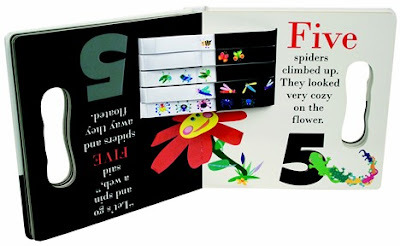 When you turn each page of the book, a brightly colored ribbon appears with an illustration of the insect or animal featured on that particular spread. For example, on the first page, you see one bee, on the second, you see two butterflies, and so on. Everytime you turn the page, a new ribbon appears until you get to 10. Then you can flip the book upside down and count backwards from 10 to 9. When my daughter was smaller, she had difficulty turning the pages on her own, but now at 2 1/2, she has no trouble at all. When I first bought the book, I was uncertain about how the book would withstand not-so-gentle toddler hands, but it really does look almost brand new after over a year of hard play. I love interactive books for young children because they help kids see that reading AND learning can be fun. Do you have any favorite interactive books in your house? As many families in the U.S. are already back to school or getting ready to go back to school in a couple of weeks, this week I'd like families to share their reading routines/habits once the kids go back to school. What family reading challenges do you face when the kids go back to school? What changes do you make to your reading routine once the kids are back in school? Do your kids have the opportunity to "read for fun," or do they seem too slammed with school work and reading books for class assignments? If you're a teacher, do you have the ability to fit in "reading for fun" time into your classroom schedule? What are some tips you have for other parents? Leave a link to your post in Mr. Linky below or leave a comment. On August 25, Babymouse is back, and this time it's up to a hero on her school's Mathletes team to win back the coveted Golden Slide Rule from rival team, the Owlgorithms. The hero certainly can't be Babymouse because she's no good at math...or is she? As always, Babymouse's imagination runs rampant as she daydreams about being a dragonslayer, a hobbit, one of the children in the Lion, the Witch, and the Wardrobe, and more. Children who are familiar with these classic tales will find the references hilarious, but you don't have to know those books to enjoy this installment of Babymouse. It's full of the familiar snarky back and forth comments between the narrator and Babymouse and the funny situations Babymouse always seems to get herself into. And of course, Matthew Holm's black, white, and pink illustrations and the graphic novel format will make this a book that kids will want to read again and again. I love the Babymouse books because of their kid-friendly format and because they reach out to a variety of readers from the most voracious bookworms to the most reluctant. The Summer Reading Chronicle, where you can find reviews of "three recent novels they [kids] could polish off for fun before school begins." Children's Bookshelf, where you can find reviews of a few recent picture books. I'm also thrilled that Maggie Stiefvater's Shiver is number five on the Chapter Books bestseller list . Go Maggie! Welcome to this week's edition of "What My Children Are Reading." This week we've been on a "staycation" and have spent some quality time at the library. In fact, we'll probably go again today since it's a rainy day. While the text is a bit too advanced for my two-year-old, she's captivated by the gorgeous photographs of different seashells that can be found in North America. I think this would make a great book for children who want to learn some fascinating facts about shells and who love the beach. This book immediately caught my little one's eye, and we've been flipping through it all week. Again, while the text is a bit too advanced for a two-year-old, the photographs of elephants in a variety of different locations and doing a number of different things from rolling in mud to getting a bath are absolutely stunning. In fact, this may be one that we add to our permanent library at home. What have your kids been reading this week? Leave your link with Mr. Linky or a comment. Pam, a.k.a. MotherReader, has officially announced that it's time to sign up for this year's Kidlitosphere Conference that will be held in Washington, D.C. on October 17th. Read the rest of her post for more details. There are a lot of awesome bloggers coming, so be sure to reserve your space! I plan on signing up as soon as I can secure childcare arrangements for the day. Maggie Stiefvater's Shiver now available. In May, I reviewed Maggie Stiefvater's newest YA novel, Shiver, the love story of Grace and Sam, a girl and a werewolf. Here's what I said, "What I love about Maggie Stiefvater's writing, especially in Shiver, is that it's completely seamless: the transitions between the two main characters' points of view and the way that she brings werewolves into what seems like a perfectly normal world." Well, Shiver's official release date is today, so go out and buy it! If you still need some convincing, read an excerpt or listen to Maggie Stiefvater reading the first two chapters here. And if you're in the Williamsburg, VA area this Friday, help Maggie celebrate the release at her launch party. I've been a fan of Lita Judge's since reading her book One Thousand Tracings: Healing the Wounds of World War II, the beautiful story of how a community in the U.S. came together to send care packages to post-WWII German citizens. See my review here. I was naturally excited to receive a copy of her latest book, Pennies for Elephants, and I wasn't disappointed. This book, based on a true story, tells the story of two siblings, Dorothy and Henry--just two of the many children who helped raise $6,000 so the Franklin Park Zoo in Boston could buy three retired circus elephants in 1914. The kids had two months to raise the money before the circus extended the offer to other zoos in the nation. In today's standards, that would be nearly $130,000. The lush illustrations take you right back to this time period, and newspaper clippings sprinkled throughout detail the progress the kids are making and build a sense of urgency as the deadline grows near. It will keep you on the edge of your seat until the very end, where kids will be likely to clap and cheer. But the best thing about this book is its inspiring message. Kids from a city that was ethnically and racially divided joined together for a common cause. They gave every cent they had and organized fund-raising events, and without everyone's participation, they would have never achieved their goal. 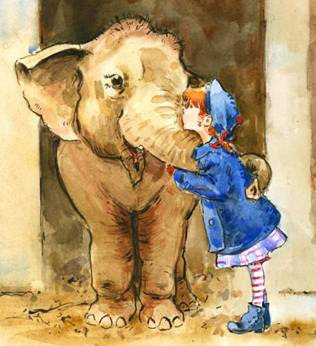 Lita Judge is an extremely talented artist and storyteller, and Pennies for Elephants is a true gift to children's literature. Download activities, get a timeline, look at old photographs and more at the author's site for Pennies for Elephants.